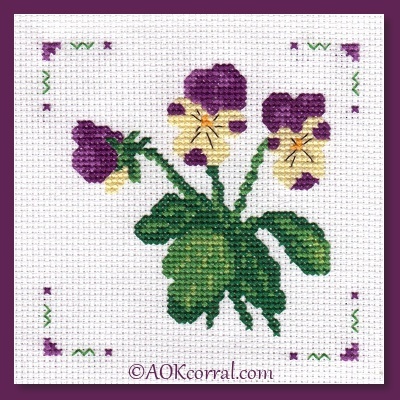 A pretty pansy pattern for cross stitch. Frame or add to your next cross stitch project. The Easy Print Version contains pansy pattern & black-eyed susan cross stitch patterns and instructions. Finished Pansy design measures approx. 4 inches wide and 4 inches high. Stitch count is 56 stitch wide and 56 stitches high. © Copyright 2015 by AOK Corral Crafts. All rights reserved. Bonus: Additional cross stitch pattern for black-eyed suan flower included.